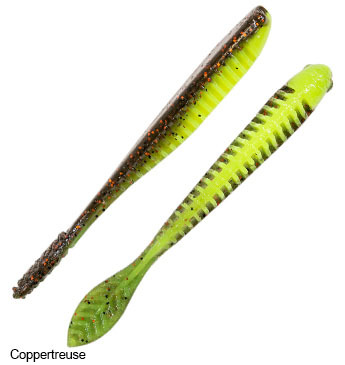 Z-Man Trick ShotZ Lure are made up from a markably soft, pliable, buoyant, and 10X Tough ElaZtech construction, the 3.5inch / 8.89cm Trick ShotZ Z-Man’s first specifically designed drop shot baits feature limber, ribbed bodies and spade-shaped tails that produce ultra-lifelike action with little rod movement, and are impregnated with salt for taste and texture. Accurately mimicking a variety of forage including shad, leeches, gobies, and minnows, their ElaZtech makeup provides exceptional tear resistance when nose hooked and facilitates a more natural, tail-up position that won’t sink to the bottom on slack line. 3.5inch / 8.89cm in size is impregnated with salt for taste and texture and come supplied 6 baits per pack.